This morning, a CN train carrying dangerous goods derailed near Clair and Wadena, Saskatchewan, sending plumes of smoke at least 30 metres into the air and forcing residents from their homes (CBC News, CTV News). The train consisted of three locomotives and 100 cars – 26 cars derailed. An explosion and fire came from petroleum distillates which spilled from two of the derailed cars. The fire was huge according to local sources, and was still burning this evening. Local officials were worried about the toxic smoke and kept people eight kilometres away from the scene. About 50 people from Clair were evacuated, as well as others from farm homes in the area. Evacuated people were sent to an operations and reception centre set up in Wadena. School students in Wadena were kept indoors during the day, as a precaution. Local farmers were worried about the safety of their livestock. Huge plumes of thick, black, heavy smoke and fire were reported as local fire departments wrestled with the fire. Provincial officials said detours would remain in place until the area is safe. Six of the derailed cars were loaded with hazardous materials, four with either hydrochloric acid or caustic soda and two with petroleum distillates. CN refuses to provide real-time data on the hazardous materials they haul across the country, which means municipal fire departments are often left guessing what materials they must deal with in order to protect local residents whenever there is a derailment and spill such as this one. This is the sixth reported CN derailment in Saskatchewan and the 29th reported CN derailment in the Prairie Provinces during the past year. CN does not report many of its derailments, so the actual number is undoubtedly higher. 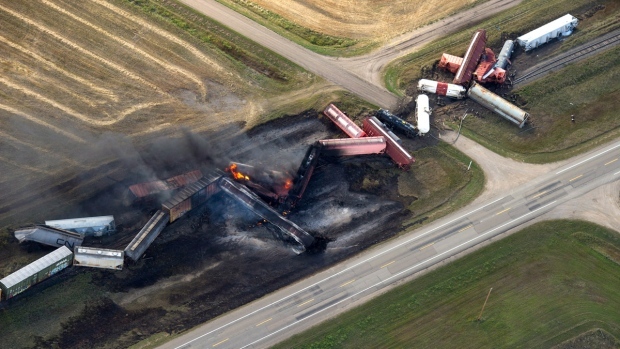 See CN Railway Derailments, Other Accidents and Incidents for details of hundreds of other Canadian National Railway derailments, spills and fires in Canada and the U.S.
~ by railroaded on October 7, 2014.